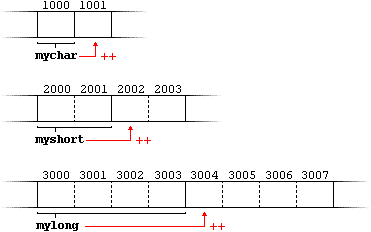 In earlier chapters, variables have been explained as locations in the computer’s memory which can be accessed by their identifier (their name). This way, the program does not need to care about the physical address of the data in memory; it simply uses the identifier whenever it needs to refer to the variable.For a C++ program, the memory of a computer is like a succession of memory cells, each one byte in size, and each with a unique address. These single-byte memory cells are ordered in a way that allows data representations larger than one byte to occupy memory cells that have consecutive addresses. When a variable is declared, the memory needed to store its value is assigned a specific location in memory (its memory address). Generally, C++ programs do not actively decide the exact memory addresses where its variables are stored. Fortunately, that task is left to the environment where the program is run – generally, an operating system that decides the particular memory locations on runtime. However, it may be useful for a program to be able to obtain the address of a variable during runtime in order to access data cells that are at a certain position relative to it. The actual address of a variable in memory cannot be known before runtime, but let’s assume, in order to help clarify some concepts, that myvar is placed during runtime in the memory address 1776. The variable that stores the address of another variable (like foo in the previous example) is what in C++ is called apointer. Pointers are a very powerful feature of the language that has many uses in lower level programming. A bit later, we will see how to declare and use pointers. As just seen, a variable which stores the address of another variable is called a pointer. Pointers are said to “point to” the variable whose address they store. An interesting property of pointers is that they can be used to access the variable they point to directly. This is done by preceding the pointer name with the dereference operator (*). The operator itself can be read as “value pointed to by”. This could be read as: “baz equal to value pointed to by foo“, and the statement would actually assign the value 25 tobaz, since foo is 1776, and the value pointed to by 1776 (following the example above) would be 25. The first expression is quite clear, considering that the assignment operation performed on myvar was myvar=25. The second one uses the address-of operator (&), which returns the address of myvar, which we assumed it to have a value of 1776. The third one is somewhat obvious, since the second expression was true and the assignment operation performed on foo was foo=&myvar. The fourth expression uses the dereference operator (*) that can be read as “value pointed to by”, and the value pointed to by foo is indeed 25. First, mypointer is assigned the address of firstvalue using the address-of operator (&). Then, the value pointed to bymypointer is assigned a value of 10. Because, at this moment, mypointer is pointing to the memory location offirstvalue, this in fact modifies the value of firstvalue. Each assignment operation includes a comment on how each line could be read: i.e., replacing ampersands (&) by “address of”, and asterisks (*) by “value pointed to by”. p1 would indeed be of type int*, but p2 would be of type int. Spaces do not matter at all for this purpose. But anyway, simply remembering to put one asterisk per pointer is enough for most pointer users interested in declaring multiple pointers per statement. Or even better: use a different statemet for each variable. When fundamental data types were introduced, we saw that types have different sizes. For example: char always has a size of 1 byte, short is generally larger than that, and int and long are even larger; the exact size of these being dependent on the system. For example, let’s imagine that in a given system, char takes 1 byte, short takes 2 bytes, and long takes 4. The void type of pointer is a special type of pointer. In C++, void represents the absence of type. Therefore, voidpointers are pointers that point to a value that has no type (and thus also an undetermined length and undetermined dereferencing properties). This gives void pointers a great flexibility, by being able to point to any data type, from an integer value or a float to a string of characters. In exchange, they have a great limitation: the data pointed by them cannot be directly dereferenced (which is logical, since we have no type to dereference to), and for that reason, any address in a voidpointer needs to be transformed into some other pointer type that points to a concrete data type before being dereferenced. Do not confuse null pointers with void pointers! A null pointer is a value that any pointer can take to represent that it is pointing to “nowhere”, while a void pointer is a type of pointer that can point to somewhere without a specific type. One refers to the value stored in the pointer, and the other to the type of data it points to.